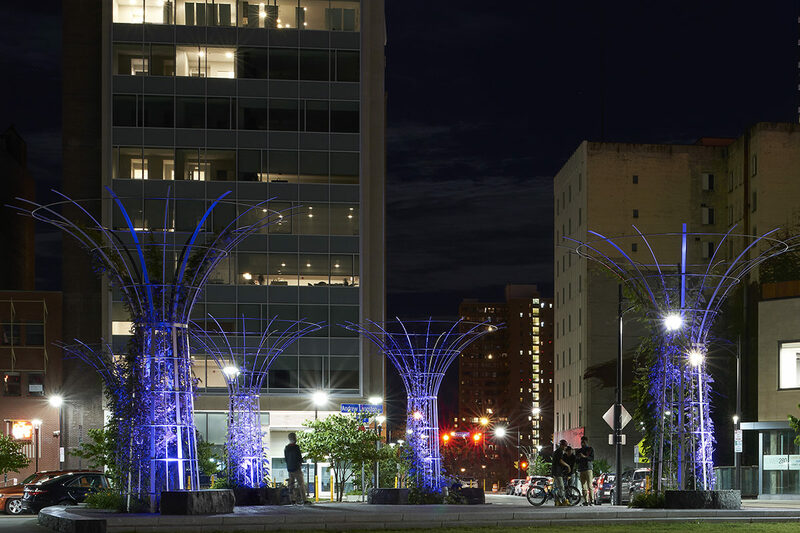 A recent article in “Public Square,” a journal of the Congress for New Urbanism, cites Trowbridge Wolf Michaels’ work at Rochester’s Midtown Commons as an example of the city’s current revival. The catalyst for the Midtown project was the removal of a massive 1960’s urban renewal era indoor shopping mall. The demolition of the building resulted in 8.5 acres of developable land located in the heart of downtown Rochester and the opportunity to redevelop and significantly reshape the city’s core. TWMLA played a key role in designing new streets and a new central plaza with the goal of establishing flexible, functional, and pedestrian-friendly public spaces. Sustainable landscape design practices, such as porous pavements, structural soil, rain gardens, and a green roof are incorporated. A performance space and a tree grove anchor the public space and facilitate programmed activities. The result of TWMLA’s work is a blossoming mixed-use district designed to attract developers with shovel-ready parcels and a redeveloped street grid.